So you wanna marry a buckaroo? And ride and rope and shoe. And always carries a can of chew. And his horse is always bridled up nice. You sure wouldn’t pause and think twice. And fixin’ your hair to go party at Stockmen’s. Maybe the Pasttime or Taylor Canyon. Dating a buckaroo is about like dating any other guy; you always put on extra mascara, he always shaves, both of you are attached to your phones at the ear. There’s so much to learn about each other, so you talk until midnight, one, two, three AM…then the alarm goes off and it’s time to check your phone for a good-morning text. And you happily accept that ring. But you envision a lifetime of riding and roping. And your saddle still looks brand-new. And if you really had to go, probably two. Single cowboys move around a lot, and, as it turns out, married cowboys do, too. After a while, you’ll get smart and only unpack the items you require for everyday use, such as kitchenware, clothes and tack. You’ll hang just enough pictures to cover the holes in the walls, and keep your kid’s toy collection whittled down to just the 150-200 toys she actually plays with. But mention every new item you buy. When he and the boss don’t see eye to eye. It’s not just a line in a song. Is the ability to just move along. We have worked (I always think and say “we” even though Jim is the one working the job, and I’m the mommy/wife/reporter-type person) on ranches where maybe the boss is a little too rough on horses and expects his cowboys to be the same way. I told Jim that if it came right down to it, and he refused to exert his horse to a dangerous point for the sake of working cows, that I’d fully support his getting fired over it. He’s a talented, experienced cowboy who can get a job on another ranch within two phone calls; I’ve seen him do it before, and I ain’t scared to see him do it again. And you call your friends in town. They’re like, “What the heck are you doing?! And only file one W2 each year. That “We’re moving again!” isn’t news. One of the major perks to our vagrant lifestyle is that when we go to ranch rodeos, we don’t sit in the Our Current Ranch section; we have friends from Idaho, Oregon, Nevada and California. You know, the four states in the Western US. I mean, the four states that produce good cowboys. I mean, the four states that are worth a darn. You know what I mean. Anyway, it’s neat to have more friends via our travels than if we had just stayed on one ranch for 10 years. Lots of our friends travel around a lot, too, so we meet people through them, and we have even more friends. Friends are fun. Friends are important. We like our friends. I’m heelin’ what you’re headin’ – I feel ya. Who didn’t ride and rope and shoe. I’m glad I married my buckaroo. And makes sure he’s tuned up good. Throwing scoop loops like a buckaroo should. Or vacation on a luxury yacht. I couldn’t ask for more than I’ve got. 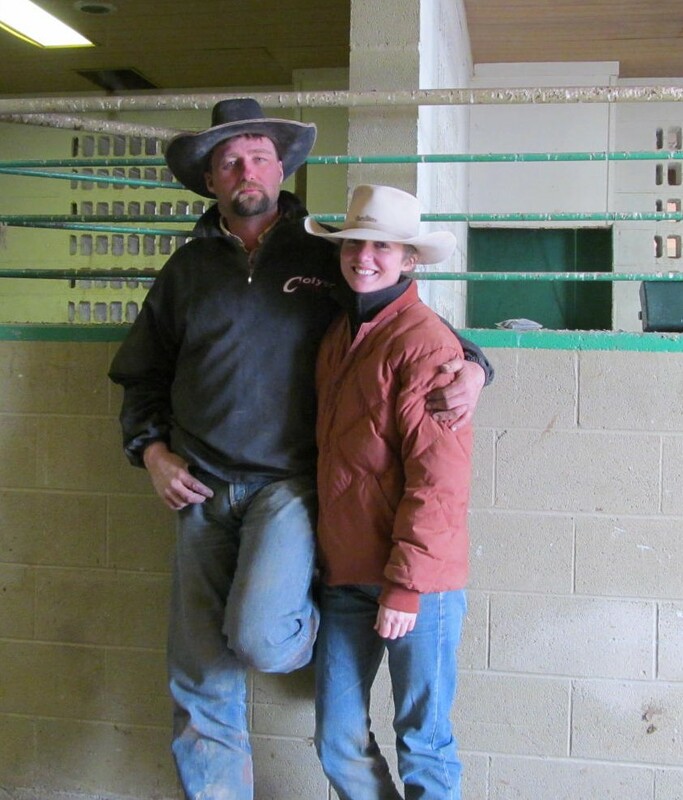 Me and Jim at the Horseshoe barn in 2012. I still wear the same hat. He doesn’t. Side note: I don’t think I’ve ever washed that coat. Totally off-topic. No idea why I wrote that. Sorry. If you like this kind of writing and Mary Williams Hyde’s awesome buckaroo pictures, check out our brand-new, first-ever, hot-off-the-press 2015 Cowboy Dictionary calendar! Go to http://www.buckaroocountry.com to check it out and order. Thanks for reading! Right on, Jolyn. And you kept it clean. Thanks Bill. You know, there’s always an unprintable version of every story. I tell that one in person, so it’s less damning in the long run. He is dating the Aussie still!!!! She was here the last couple months, (started his colts lol) and she’ll be back again in February!!!!! OOo she read it. haha she said tell her we are still going strong!! Hey girl, didn’t know you write poetry too! Loved your little annotations too. Any chance you’ll make it down to Elko again this January? Hi Amy! I used to write cowboy poetry when I was a kid and perform at our little local shows in Northern California. I got a creative urge and busted it back out again 🙂 We now live near Austin, so we might make it back UP to Elko, we’ll have to see!